Melbourne three-piece development outfit Bit Dragon have finally unleashed their debut game Hyper Jam upon the world after several strong PAX showings. This was one of those games on the show floor that always had a throng of people surrounding it from open to shut, and one I’ve had a keen eye on since I laid eyes on it. Hyper Jam’s simple-but-fun frenetic brawler gameplay is as endearing as ever, but with some barebones mode selection on offer, the game does fall victim to a certain lack of variety. 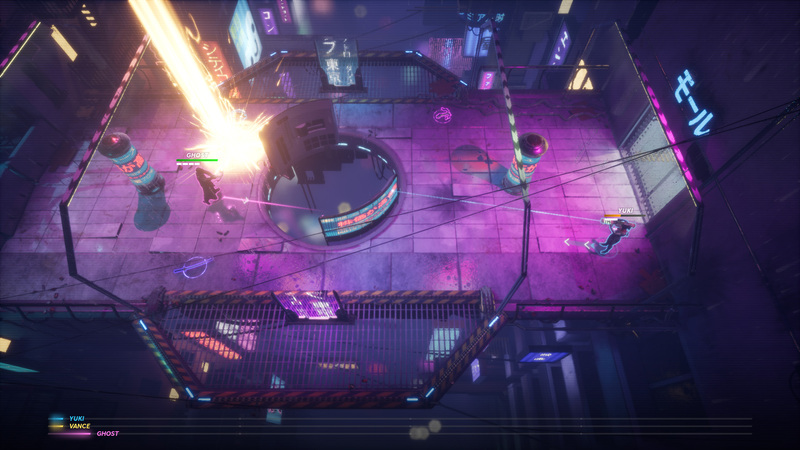 With no story to speak of, Hyper Jam thrusts you straight into the boots of one of four players duking it out in a variety of arenas. These ruthless free-for-all matches are played out in rounds whereby players earn points for kills and damage dealt. The first player to reach a certain point limit and survive the round wins the game. With an isometric view and tight battle arenas, players must pick up randomly spawned weapons such as swords, giant hammers, grenade launchers and homing missiles to obliterate the opponent, all while avoiding each arena’s unique hazards. If players aren’t dispatching one another fast enough then the already bite-sized arena will begin to shrink and force the remaining players into a tense sudden death confrontation. Death in a round is not the end either, with killed players being able to periodically call in a targeted strike on the enemy. While no points are awarded for killing someone in this way, it’s a great way to take the edge off that bitter humiliation of defeat in a round. The overall gameplay sounds simple (and it is), but a unique twist in the form of the perks system keeps the round-to-round dynamic fresh. Each player gets to pick from a pool of four perks at the end of the round, but in a Mario Kart-esque level of underdog favouring, the player with the least amount of points gets to choose first. Not all perks are made equal, and boons such as vampirism (healed by a portion of damage dealt) and health regen are in high demand. Perks which periodically add burn, freeze or confusion (invert movement controls) effects to attacks are also crowd favourites. All perks stack too, meaning their effects can become more and more pronounced to almost comical extents if the match lasts a number of rounds. In one instance, a player that had spent the whole match at the top of the points tally had acquired a real who’s who of perks no one would ever choose first, namely one that increases movement speed when your health is low. He’d stacked a good four or five of these bad boys over the course of the match, such that when his health became critical he moved with the lightning speed and effortless grace of a young Baryshnikov. It didn’t actually clinch him the win in the end, but it was nonetheless a wondrous sight to behold. Hyper Jam’s issue is not that its gameplay isn’t compelling, but rather that there’s just too little meat on the bone. The free-for-all mode I described above is playable both offline with bots or in split-screen, or alternatively online with strangers or people who claim to be your friends but then mercilessly target you for kicks. But at the end of the day it’s only a single mode, where something like even an additional 2v2 mode would have given things a little more spice. There is a persistent levelling system that allows you to unlock new skins and taunts for each of the four characters, but these are needlessly difficult to access and can’t be previewed. The cosmetics are a nice touch and help distinguish you in the arena, but it’s not likely to be a juicy enough carrot on the stick for the average gamer. Hyper Jam is a stylish and fun multiplayer brawler that harkens back to the golden age of good ‘ol same couch gaming. It’s an accessible and frantic title that will no doubt be a hit in any lounge room when you whip it out at a party, and it’s also a great way to prove your dominance amongst friends and/or spark a bitter blood feud. The moment-to-moment gameplay in the mode on offer has clearly been well-polished by Bit Dragon’s hard-working team of three, it’s just a pity that Hyper Jam’s bag of tricks ends up being a bit shallow.